Earlier this morning, Amazon announced that it would open its Android Appstore, calling for developers to submit their apps for international distribution via its Amazon Mobile App Distribution Portal. It’s a big step for Amazon; the company had previously limited app sales to the US, because it chose that the only device that could run them — the Kindle Fire — would be sold there exclusively. By opening app submissions to developers in the UK, Germany, France, Italy and Spain, it guarantees not only will Amazon provide the opportunity for revenues to be made in new countries, but it also means that the company is going to launch a tablet that can run them — meaning that the Kindle Fire is finally coming to Europe. It could also mean that apps will come to other devices in its Kindle range but with the company reported to be working on up to three new tablets, the smart money says that Europeans are to get a taste of Amazon’s tablet device and its associated media services. Amazon’s Kindle Fire launched in the US in September 2011 for $199.99 but it took another six months for the company to launch its Appstore. The app marketplace is home to thousands of Android applications, serving as third-party equivalent for Google Play, but download revenues are shared directly between Amazon and developers on its platform, not Google’s. The online retail giant has launched all of its Kindle e-readers worldwide, finally shipping the Kindle Touch 3G to 175 countries in March, but with many speculating it would soon follow, the Kindle Fire has failed to emerge on European shores. At least until this summer, it appears. Amazon says that apps will be available to download via its Amazon Appstore this summer in the United Kingdom, Germany, France, Italy and Spain, its most popular regions for Kindle sales. Whether this means that customers will see the same 7-inch tablet form-factor remains to be seen. We fully expect Amazon to update its lineup of Kindle e-readers and Kindle Fire tablet this year after a 12 months on sale but this time around Amazon is set to launch in more than one region (we should see a new tablet be unveiled in the coming months). The company will want to boost tablet sales and tempt consumers away from Apple’s iPad, Microsoft’s Surface (we couldn’t have said that last week) and a whole host of other Android tablets from various reputable mobile companies. 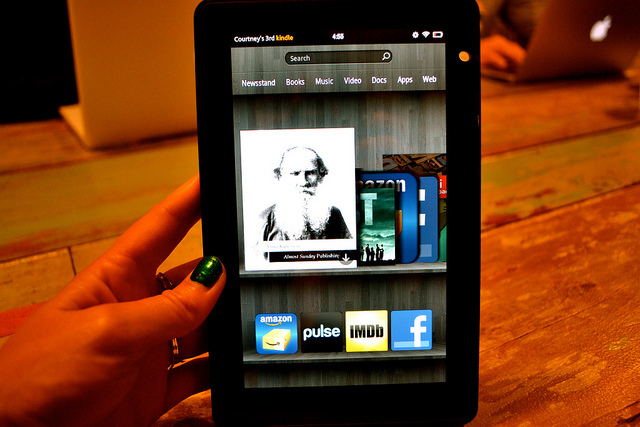 Since then, Amazon has remained quiet on Kindle Fire sales, which are reported to have continually fallen in the light of increased iPad sales. Amazon has already sealed movie deals in the UK and Germany by way of LoveFilm and it already sells a huge collection of MP3’s in Europe. It would need to ensure that the services that US Kindle Fire owners enjoy now will be available in those European regions, but it has time to secure those rights if it hasn’t already. The introduction of the Kindle Fire in key European markets would expose the media-centric device to more consumers, helping to boost its video, music and app services — it’s now just a matter of time until we find out whether Europeans will get the existing model or new 7-inch or 10-inch tablets.